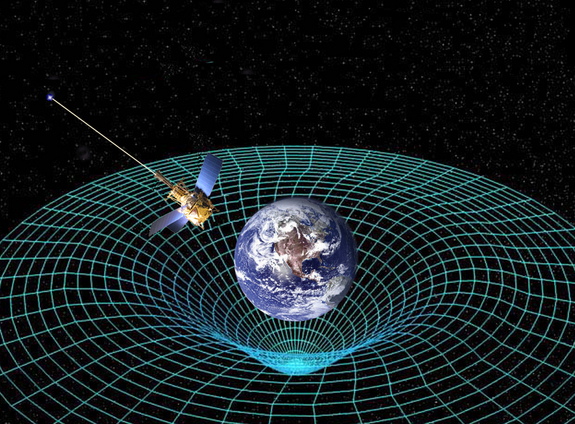 GRAVITY'S CENTURY Einstein's general theory of relativity, published in November 1915, describes gravity as the warping of spacetime by masses such as the Earth and moon. In 1915, the universe was small and static. Space was smooth. Gravity pulled things to the ground. At least that’s the way it was in the minds of all but one exceptional physicist — Albert Einstein. After years of pondering the interplay of space, time, matter and gravity, Einstein produced, in a single month, an utter transformation of science’s conception of the cosmos: the general theory of relativity. His special theory of relativity, introduced a decade earlier, had united space with time, and matter with energy. Soon thereafter he saw that a generalized version of relativity would merge spacetime and matter-energy to produce gravity. Rather than “pulling” each other together, masses warped the fabric of spacetime — and then moved through spacetime along the curves that such warping produced. Einstein’s space-bending theory was mind-bending. It not only succeeded in explaining gravitational mysteries where Newton’s law failed, but it also predicted amazing unsuspected natural phenomena, from black holes to the expansion of the universe itself. No longer small and static, Einstein’s universe is expansive and dynamic, home to a zoo of bizarre astrophysical beasts inexplicable without general relativity’s help. Today astrophysicists manipulate those phenomena to probe the heavens, while other physicists seek ways to reconcile general relativity with the past century’s other revolutionary theory, quantum mechanics. It may now be that general relativity’s confluence with quantum mechanics is on the verge of producing a new theory, glimpsing more deeply into the essence of existence than even Einstein was able to see. But it wouldn’t have been possible without him.